The embarrassment you feel when showing an empty gap in your smile is bad enough. But did you know missing a tooth can hurt your jawbone? Your jaw is designed to have teeth, so it makes sense that a lost tooth can lead to problems. Thankfully, you can call Dr. Dores today at 413-241-3995 and make your initial appointment for a dental implant. Not only will this help keep your jawbone healthy, it will restore your smile. Your teeth have roots that extend down into your jaw. This helps your teeth stay in place. But whenever you chew, vibrations extend down into the bone tissue and stimulate it. This helps keep your jawbone healthy. When you’ve lost a tooth, you’ve also lost some of that stimulation. The bone tissue where the tooth’s roots used to be starts to degrade and disappear. The longer you go without that stimulation from the tooth, the more bone loss you experience. Over time, this can weaken your jawbone and make it unhealthy. That’s where a dental implant comes in — literally! In this restorative dentistry treatment, Dr. Dores will carefully place an implant in the jawbone. Then you wait a bit while the bone tissue there grows around the implant and locks it in place. Then you will get a replacement tooth connected to that implant. Whenever you chew, vibration travels down the implant and stimulates the bone tissue like normal. This helps your jawbone stay strong. There are other ways to replace a lost tooth. Dental bridges and dentures both work, but neither one helps prevent bone loss. 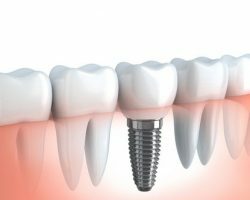 Those might work for you if your jawbone is too weak already, but a dental implant is often a great choice for people. Your teeth coming together properly when you bite, which can help avoid TMJ disorder. Teeth on either side of the implant will stay in place and won’t get crooked. You can still eat, brush, and floss like normal. Dental implants are so close to being real teeth that you do not have to change your routine. You won’t hurt the gums in that empty spot when eating hard foods like chips. A huge benefit that often gets overlooked is your confidence. When you have a gap in your smile, it’s understandable that you don’t want to show it to others. You end up smiling less, and no one deserves that. By using this procedure to replace the lost tooth, you can improve your self-esteem and feel confident when smiling. Waiting to replace that lost tooth will not help. That’s why you need to take the first step and contact Dores Dental today at 413-241-3995 or through our online form. Dr. Dores has been helping people keep their jawbone healthy for many years, giving him the experience to match his advanced training.